The official state vegetable of Georgia is the Vidalia® onion. Georgia’s sandy soil and mild growing climate are credited with their sweet taste. Sweet Vidalias were discovered 75 years ago by surprise when a Georgia farmer found his onions were not hot! Vidalias, by law, can only be grown in 20 Georgia counties. 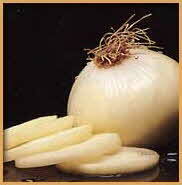 Vidalias generally have half the sulfides—the stuff that produces both tears and indigestion!—of other onions.